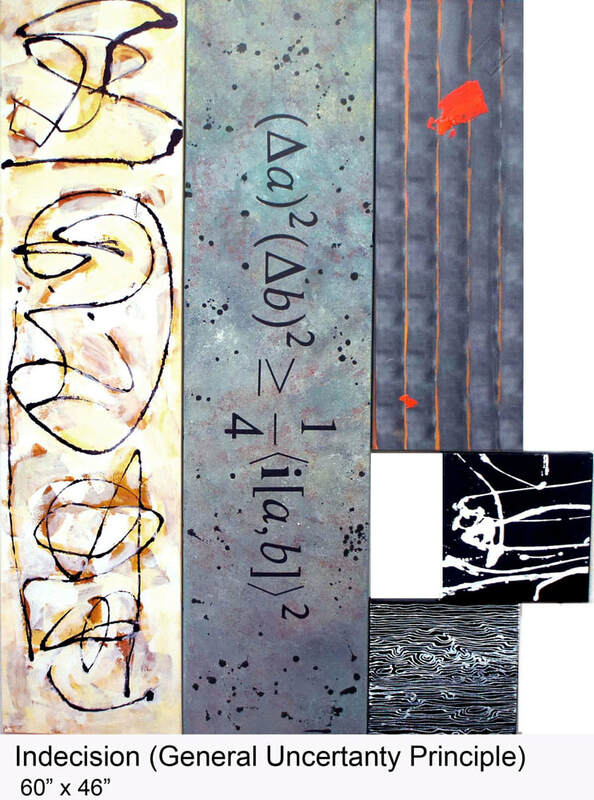 My paintings combine abstraction with science and mathematics. For many years I have used scientific concepts in my artwork. The scientific and the mathematical images in my paintings are derived from real scientific research. They describe our new understanding of the universe. The artistic and scientific revolutions of the last hundred years have changed our lives and the world around us in basic and profound ways. I feel it is important for my work to reflect this perspective. My abstract paintings, combined with scientific notation and the concepts they describe, reflect different aspects of reality that exist simultaneously in our world. I paint with acrylic on canvas or wood panel and on paper with collage and monotype. My paintings range from tiny (one inch square) to as large as sixteen feet. Art, life, matter, and all the universal forces form complex systems. In my work I attempt to show how all the different parts are linked and integrated. My paintings are based on combining the elegance of science and the visual richness of art. contemporary relevance yet with a timeless quality in their work"
"A group exhibit of gallery artists showcasing smaller format work." "​Colorado Women in Abstraction" features the work of women artists who have been influential in the abstract movement in Colorado. ‌"
"We all feel it. Sometimes it makes us jittery and unable to function properly, but sometimes it spurs our creativity and critical thinking. This is a show of paintings about anxiety and the brain chemistry, physics, and genetics that are among its causes. Anxiety is being human." Calendar: Arts & Exhibits: "Cookies and the Cosmos"
Thought provoking​ abstract artist Sue Simon combines her two passions - science and painting - in this quirky exhibit. To show that both small and large objects are part of the same solar system, the Denver creative depicts Oreos and fortune cookies in orbit alongside numbers and mathematical formula in her oils and collages.